We have received a lot of feedback that the loot roll could both be distracting and cover up too much of the screen space during crucial moments. 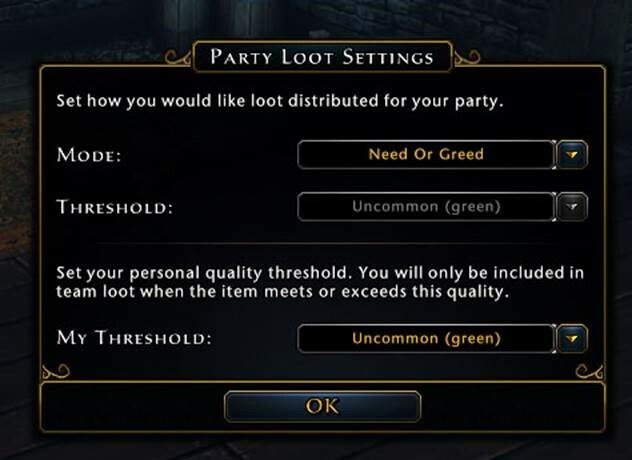 When the loot mode is set to "Need or Greed", all uncommon (green) loot and higher will automatically be rolled on. If a player can roll Need, they will. Otherwise they will roll Greed. Any loot that is Bind on Pickup will default to the old style of roll where players can choose to opt in or out. Each player has a personal loot threshold which will determine what rarity of loot they want to roll on. Example, if you set your threshold to "rare" you would pass on all uncommon loot rolls. The results are show in a small window at the top of the screen and in chat. Other modes of party loot roles are unchanged. Pictures coming soon, all feedback is welcome. If an item isn't BoP and you are set to Need Greed, rolls are automatic. There is no pop up to choose what roll you want. I seriously wish they'd just scrap loot rolls altogether and have INSTANCED loot for each player. Would save a lot of player time and constant interruptions to gameplay. Any chance of an option to distinguish between stackable RP items and unstackable gear items? Because I'm happy to "roll" on every Black Pearl that drops but I can take or leave every unidentified Green-Quality Armor. I don't object to getting them, that's free RP on the hoof, but also I don't care about them because they take slots and time to refine. But I'd be happier to be able to say "roll me on all the Peridots but pass on the Evasive Gloves Of Stomping"
just do away with loot rolls altogether or leave it as it is. Anything really worth keeping is already Bop, BoA, BoC anyways. I cant believe with all the issues in tis game the devs are wasting their time on loot rolls. How about adding a auto pickup instead so I dont have to waste time grabbing stuff after I kill large groups of monsters? This is the first step towards the auto-loot pet/comp that you guys have mentioned ? Which there wasn't anyway for green items which are the screen clogging ones if you set the loot threshold to blue. Overall, I like this change. However, I long ago set the threshold for the party to blue and am not bothered by this in most cases. It will be a help in Chult, especially as I mostly group with my wife. It'll be nice for us not to have to choose to roll on the rare drops and just have that done automatically. I dislike this change. The group I run with we do hunts often and many will pass even if we can need or greed on it to ensure that who should get the drop gets the drop. This new method IMO is not the way to go. What I wanted with the window is make it smaller and off to the left or right hand side of the screen. I still want to need, greed or pass on it. The other methods besides Need/Greed still work how they used to, the group could use Leader Decides for example. Also it only auto rolls on items that don't bind on pickup, which means the items can be traded off to the other person. There is no issue with hunts. The gear is bind on pickup so won't fall under the new changes. The lure pieces can be traded, so if you trusted someone not to roll on the drop before I would assume you'd also trust the same person to trade you back your lure piece if they accidentally won it in the new system. An extra step for sure, but requires no more trust than the current system. Two clicks: ID all green gear. Three clicks: Convert all identified green gear to RP. Oh no, you trolled me by adding all those Peridots to my inventory instead of taking some of them for yourself, you baiter you. What a monster you are, so mean, it scares me! Please don't throw me into that there briar patch. Moderator edited out some inappropriateness. If an item will bind on pickup then it will trigger a normal role which will allow the members in your group to pass on it to make sure the right member gets the item. Why do we need "need/greed" at all? You either want an item or you don't. Even if my toon can't use an item, one of my alts could. So why am I forced to roll greed then? That way I have probably no chances of getting it all. The most irritating thing to me about loot rolling is when you've got some dullard up ahead who's sailed past every living thing, yet wins every single roll for the stuff that's dropped in her/his absence. When you're in a group, right-click on your picture in the upper left corner and choose "Set Loot Mode". You can change it to "Party Leader Decides" and that will let whoever is the lead pick who gets it. Thank you very much xD I don't know how I missed that one. I was a bit confused from the other games i played in the past. Thanks! Good luck and have fun. You're welcome. You could also set it to "Free For All", but the odds are you're going to forget you made this change when grouped with other people and at least "Party Leader Decides" gives you a reminder and some control. You can set your own preference, be it green, blue or purple. so it is stated that auto roll only happens on tradeable things. yet from what I've seen it doesn't appear the tarroka cards are tradeable? or are they and I just can't figure it out? You can trade tarokka cards through the mail.